The Revere High School boys’ basketball team (1-2 in the Northeastern Conference, 2-4 overall) started 2019 with a close competitive overtime win over rival Chelsea on Wednesday night, Jan. 2, 49-45. The Patriots closed out the old year playing in the Malden Golden Tornado Holiday Tournament, where they lost to the host team, 56-48, in the opener. They then dropped the consolation contest to Medford, 57-45. The win over Chelsea couldn’t have come at a better time for coach Dave Leary’s squad, as they hope to begin this New Year with renewed hope to turn this season around in a positive direction. “As always, there was a great crowd on hand for this game, and the two teams did not disappoint,” said coach Leary, who has Derek Anemoduris and Ricky Hayes alongside him as his varsity assistants, while John Leone is the JV coach, and Bob Sullivan is in control of the freshman club. Chelsea jumped out to an early 5-3 lead, but back-to-back hoops from senior forward Omar Bendjahene (12 points, 7 rebounds) gave his teammates the lead. Both teams then struggled to score, but by the end of the first quarter the Revere boys were able to remain in front by one, 11-10. The second quarter was more of the same. The Patriots managed only six points via three-point shots by Sebastian Vanegas and Dillan Day. As a result, the locals trailed the Red Devils by three at halftime, 20-17. Senior center Nick Ciciulla (12 rebounds, 4 blocks) had a huge game, containing Chelsea’s six foot, eight inch big man C.J. Moore-Perkins, while junior guard E.J. Leone (10 points, 10 rebounds) found his scoring touch with eight points in the second quarter alone, according to Leary. Despite those impressive individual performances, Chelsea was still in front after three quarters, 32-31. The cold shooting by both teams continued throughout most of the final quarter until senior guard Scott Montefusco hit a clutch three-pointer from the corner off a set play to tie the game at 39 with just 40 seconds left. Chelsea guard Mazariegos Deleon then came right back down the court and scored to make it 41-39 with 17 seconds remaining. Coach Leary then called an immediate timeout to draw up a play in an attempt to get Montefusco free for another three, but his shot rattled off the rim. However, Bendjahene was positioned perfectly to tip it home to force overtime. In the extra period, sophomore forward Dillan Day (12 points, 6 rebounds) made his first two shots to give his mates the early lead, and after a huge steal and layup by E.J. Leone with less than a minute left, the Patriots were able to salt the game away. On Thursday, Dec. 27, the basketball Patriots traveled to Malden High School to begin the aforementioned Golden Tornado Holiday Tournament, where they took on the host team. The game started slowly until senior guard Scott Montefusco (6 points) was able to hit a three to give Revere a slight edge. But Malden closed out the first quarter on a 4-0 run to lead by one, 10-9. The second quarter was also tightly contested, with neither team leading by more than a basket. Junior guard E.J. Leone (12 points, 6 rebounds) and senior forward Omar Bendjahene (9 points) did most of the scoring in the quarter, but then Malden caught fire with threes to stretch its lead to 27-20 at halftime. The second half was more of the same. Revere clawed back to cut the lead to just two a few times behind the great guard play of junior Amara Bockarie (7 points, 5 assists) and senior Sebastian Vanegas (6 points). Malden answered back with a 10-0 run to maintain the lead, 46-34. But the locals once again did not give-in, when Montefusco and Vanegas hit consecutive three-pointers. The Malden lead shrunk to four, but they were still able to hold on for the win. Two days later, Revere took on Medford in the consolation game. They did not respond early on, when the Mustangs scored the first nine points of the game. Leary was not happy with his starting five’s effort, and immediately went to the bench that seemingly gave the team a boost. Junior forward Scott Toglan (6 points, 4 rebounds) and Day (9 points, 6 rebounds) helped bring Revere back, but the visitors still trailed after one, 13-6. 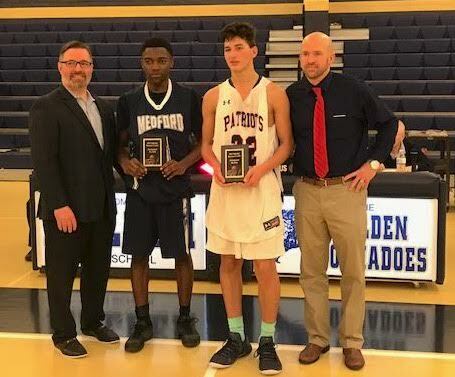 The Patriots got another spark off of the bench when sophomore forward Wilfredo Martinez chipped in with 11 points and 7 rebounds that helped earn him all-tournament honors for his consistently fine play in both games. But Medford still led at halftime, 26-22, and the third quarter was more of the same. Revere played tough defense, but still struggled to score consistently. They trailed, 38-30, after three. The Patriots were able to turn it around against Chelsea, and they hope to make it two in a row against host Saugus on Friday night, Jan. 4, before coming home to take on Everett Tuesday night. Both games will begin at 7 p.m.